Shrigley Road runs from the junction of Palmerston Street, Church Street, Ingersley Road and Hamson Drive out of Bollington towards Pott Shrigley. 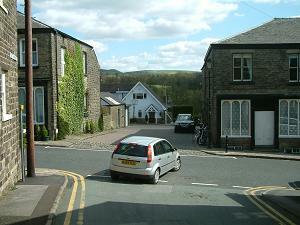 At the lower, town, end the properties are stone cottages (left) with the occasional detached house. Approach from Pott Shrigley or Palmerston Street. 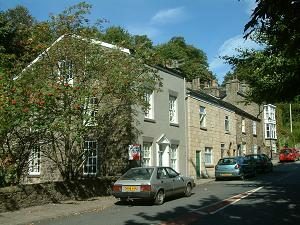 The two most notable properties are 4 Shrigley Road, a stout detached house beside the river which used to be a shop, and number 18, Newbridge House, built in 1794 and occupied by the general manager of Oak Bank Mill. The mill, a cotton printing works, stood where Hamson Drive is today. The near end house in the picture above was occupied by Joseph Hamson. He was a plumber and decorator and set up business there in 1806. 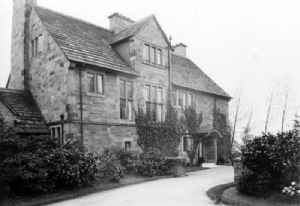 His descendants continued the business there and his several greats grand-daughter, the late Cllr Betty Bonson, lived in Bollington into the 21st century. If you look closely at the end wall of 6 Shrigley Road you will be able to see the faded remains of the large advertisement for the business painted on the stonework. 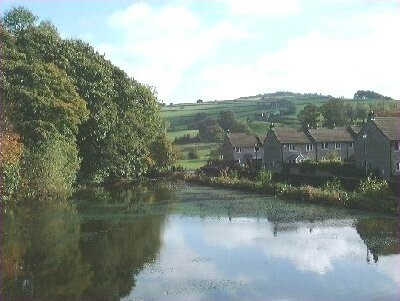 Opposite the cottages at the lower end of the street is Oak Bank mill pond, used today as a fishery. 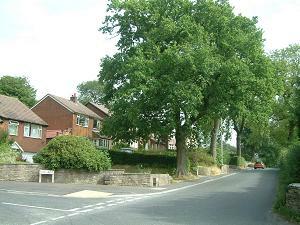 The houses to the right of the picture are in Willow Bank Drive. Looking from Beeston Mount across Shrigley Road into Shrigley Rise. The building on the right was once a shop. The building on the left across the street had a lift to get goods up to the first floor. The pulley is still there. The picture shows the line of the old pack horse route. It passes today as a footpath to the right of the house in the background and down into the field below towards Ingersley Road. The track is particularly visible in the field during dry weather. This view is looking up Shrigley Road at the same cross road as the picture above. On the right is one of the very few sets of original wrought iron railings remaining in Bollington after most were retrieved for munitions in WWII. Rainow View is off to the right just behind the camera. Up to this point Shrigley Road used to be known as Shrigley Brow. Brows are described on another page. 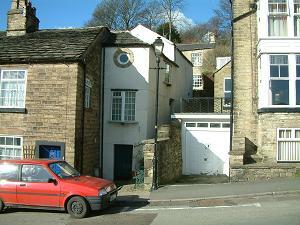 There was a smithy in Shrigley Road, the white cottage pictured left. Beside it is a ginnell leading to two further cottages built into the hillside at the back – their back roofs are level with the ground with only a narrow gap between. There were a number of shops along Shrigley Road. 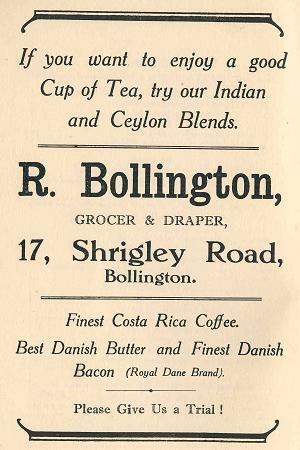 This advertisement (left) from a recipe book1 published in 1928 advertises one at number 17 owned by someone with the name of Bollington. The Vicarage stands back from the street and cannot be seen unless you know where to look! It was built in 1905. At the Pott Shrigley end the houses gradually become more modern, the last one having been built in 2005. The fields to the right of the road going towards Pott Shrigley cross over the boundary of the Peak National Park, just giving Bollington a contributor’s interest in the park! Recipes & Quotations, put together and published by the Bollington Wesleyan Bazaar in 1928. BCS collection. 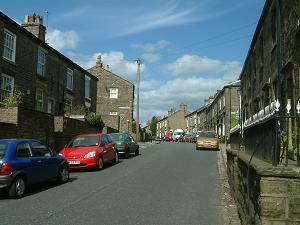 Part of this street is in the Bollington Conservation Area. Numbers 2, 4, 6-18, 20-58 and 1-35 are subject to Article 4 Direction.